I wish all my visitors, readers and foodies a Happy Ugadi and Gudi Padwa. Ugadi to the Telugu speaking people marks a beginning of a new year in which nature is in full bloom, symbolizing regeneration and celebrating the season’s freshness. 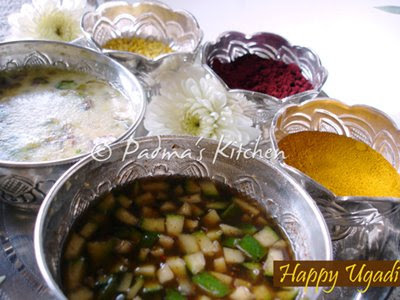 But the most unique and significant tradition of Ugadi is beginning the new year with savoring a unique flavored pachadi (chutney) that epitomizes the spirit of Ugadi called "Ugadi Pachadi",with sweet,sour,pungent, salty, hot and bitter tastes (shadruchulu or six tastes). This chutney or sauce is a symbolic reminder of the myriad facets of life in a sense prepares us for the year ahead. 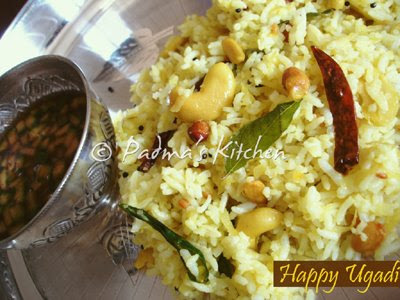 happy ugadi padma.. nice to see you update ur blog after a long time. may god give u all the very best in life. Hey Padma...Happy Ugadi to you and ur dear ones...you have a wonderful collection of recipes ....I simply love all ur recipes...Cheers! I've been reading about this on another blog. Happy New Year! A rather belateed but very happy Ugadi to you. Hey Padma, Nice to see u after such a long time in Blogging. Even I took a long break and now I am back too missed blogging. You have wonderful recipes. Love to try them all. Thanks for sharing. When it comes to rice meals, I am a big fan, the first time I saw the photo in the lower part of the blog, I already knew that it a healthy meal. It has herbs and spices from the spice rack. It is really important that you put a spice rack in the kitchen because you can cook anything you like without limits. Telugu thanam uttipaduthondhi padma mee ugadhi pachhadi tho,pasupu kumkuma latho..